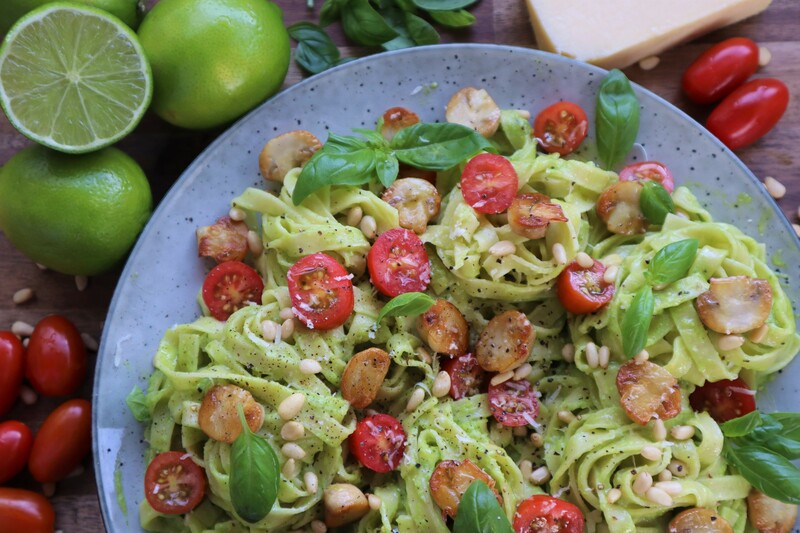 Weekends call for pasta and this deliciously creamy avocado fettuccine is packed full of goodness, looks beautifully fresh and healthy and tastes delicious. It is a real crowd pleaser and fairly simple to cook – making it ideal for a weekend lunch with family and friends or for a quick weeknight dinner. The mushrooms and tomatoes add an additional health boost, however if you prefer you can also serve this pasta on its own or with fresh green peas or broccoli. For a more decadent pasta, layers of crispy fried pancetta on top will also taste delicious. To make Avocado Sauce, add all ingredients to a food processor, season with salt and pepper and blend until smooth. Set aside. In a large pot of salted water, cook fettuccine to packet instructions. In the meantime in a frypan on medium heat add 1 tablespoon of olive oil and mushroom. Fry mushrooms until they are golden brown (about 5-8 minutes), turning regularly. Once pasta is cooked, remove from heat and drain. Toss through Avocado Sauce until all of the fettuccine strands are coated. Serve pasta on a large plate and top with fried mushrooms, halved cherry tomatoes and fresh basil leaves. Sprinkle on extra pine nuts, season with salt and cracked pepper and finish with freshly grated parmesan cheese. Enjoy! Love pasta? Click here for our 15-Minute Pantry Pasta and here for our Spaghetti with Seared Asparagus, Buffalo Mozzarella and Chilli. I hope you enjoy it, it is so easy to make! Simple, yet delightful. Thanks for the recipe.